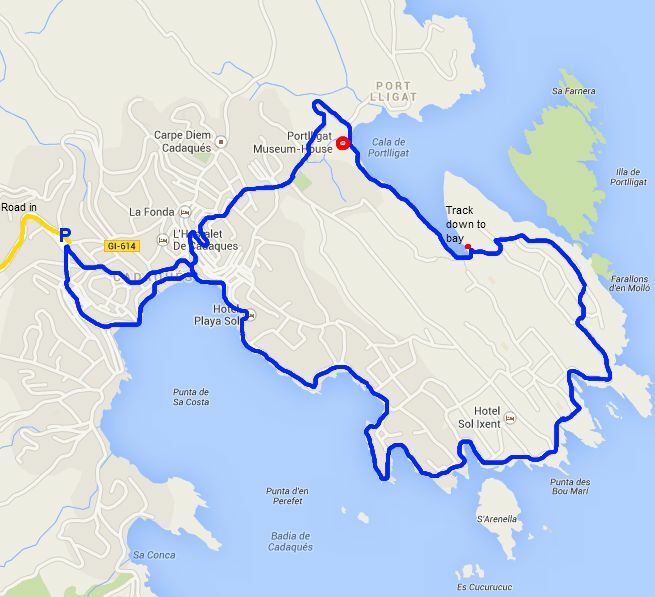 For us this is only our second visit so we're not aiming for a complex route - something simple and straightforward to get a feel for the area is perfectly fine for us, so this is just a standard easy-to-follow Cami de Ronda route. Arriving in Cadaques by car there are big signs about the general lack of car parking with the advice that cars should park in the main paying municipal car park which we did, but it's a little expensive - close to 3 euros an hour. If you are walking, we discovered there is free parking out towards Port Lligat and the cemetery which is far enough out of town to be a good 10 minute walk to the centre and would have space out of season. 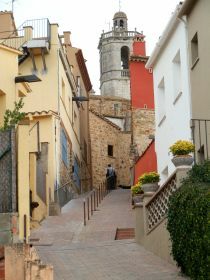 The old part of Cadaques sits on a small hill with the church at the top. 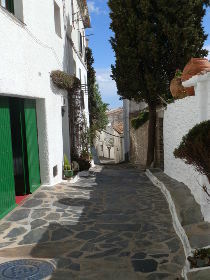 The main car park sits just behind this hill, but lower down, so to start we head up the hill towards the church, through the very narrow streets lined with terraces of white-walled houses that give Cadaques its distinctive look. The streets themselves have a stoned surface, though unlike cobblestones these are narrower more slate-like stones with edges upwards in diagonal or herring-bone fashion and in places the road itself is actually the raw rock of the hill. 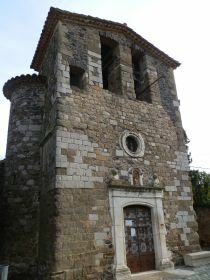 The church, being the high point of this part of the town, has views from its small courtyard in the front towards the sea and along to the cliffs and lighthouse in the distance on the right. Taking our fill, we head down towards the sea through the lanes passing by houses with plant pots outside their windows and pots lining the street edges. At the beach, the town suddenly seems busier. 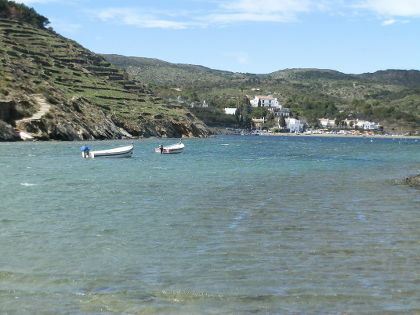 The beach at Cadaques is a rock and shingle beach - people generally wouldn't come here for a beach holiday - the town has much too much character for that, and the area is generally rocky and stony, with the sedimentary layers of the rocks occasionally turned vertical and eroded and sharp, but perfect for diving, fishing or water sports. The beach itself has plenty of people even for March, though wrapped in coats against the wind. 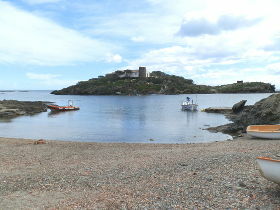 Around the beach area are restaurants and bars and a central statue of Dali looking back towards the town. 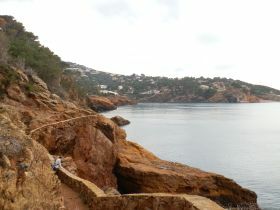 We continue across the beach and then around the Cami de Ronda. To begin with the path shares the road as it runs next door to the sea. 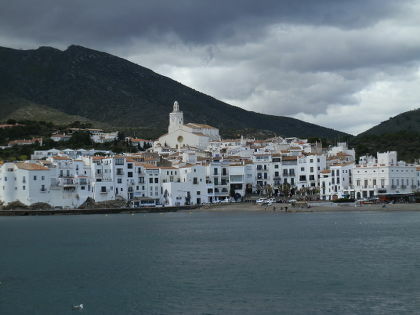 We're on the leeside of the bay so the wind has dropped and each time we turn back we get another picture postcard view of Cadaques. Towards the end of the bay we cross another small rough sand beach and take the path around the outside of a house as it runs around the top of the final set of rocks that have views back to town. Across the bay we can see the cliffs and an isolated lighthouse. There is more walking in this area including routes to Roses about 16km away - too far for a family round trip. Around the house and the headland, Cadaques disappears and the scenery changes - becoming bleaker with much more rock stringing out into the sea. Across from us is a small island with a house and a watch tower on it. From behind it looked like another headland, but we can see now there is open water between the beach in front of us and the island. The path continues around any number of rock headlands - perfect for hunting crabs in the summer or for skimming stones from the beaches. The sea in the distance from us is stormy with white horses, but close to the bay the water is smoother. Just inland from the sea front are newer houses and modern architecture villas that seem a little out of place from the wildness of the coast. At the end of the headland we cross a rise and get the full blast of the wind in our faces. The sea below us is much more open to the elements with waves crashing against the rocks, but with a deep blue sea that we can see all the way to France. We follow the road down past a row of seaside houses that seem to be snuggling next to each other to keep out the wind. The headland is more like a spit so we have to turn around. 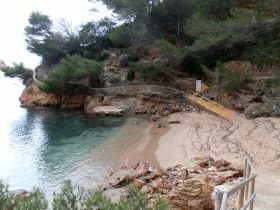 Fortunately we see the Cami de Ronda sign which takes us down a narrow track into the woods and a scramble down to the bay between the spit and the main land. In front of us we can see a wild, almost Scottish landscape with the huddle of houses of Port Lligat in the distance, but no other buildings nearby. We cross the beach in the bay and follow the track along the side of this new bay. Above us are ancient looking terracing for olive or vine cultivation that look as if they could have been on the hill since Roman times. 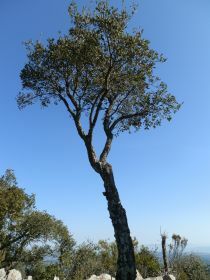 The path is still narrow and 2-3 metres above the sea. At one point we have to cross sloping rocks that seem to want us to make us slide into the sea. 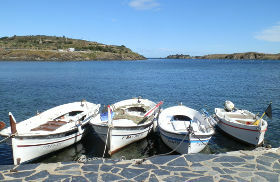 And then we arrive in Port Lligat, a handful of brightly coloured fishing boats on the small quayside and then around the corner at we're at Dali's house. We're not visiting the museum and from the port side it looks like a large traditional Catalan house, but with white walls with a few neighbouring houses. We take the chance to enjoy the view and the location then take the road up the hill. As we go up we can see the Daliesque touches like ceramic eggs on the roof and two silver heads, but it is much more subtle touches than Figueres for instance. Then back into town, cutting into the confusing network of small lanes to see if we can navigate our way back. We arrive at the main square with trees wearing knitted sleeves and navigate through more streets and back to the car. 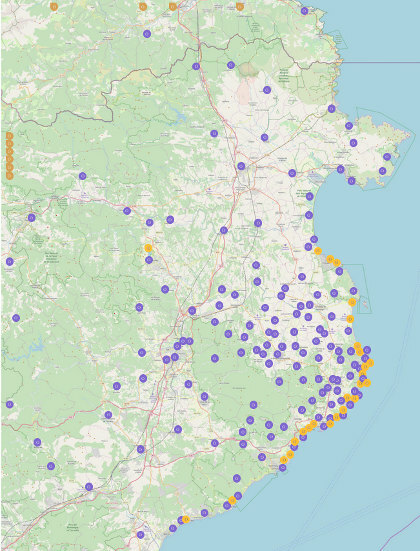 Having just had a large forest fire on the Costa Brava, now we've just had a small (3.9 Richter Scale) earthquake with an epicentre just off the coast between Palamos and Palafrugell. It's quite unusual - the Costa Brava is definitely not an earthquake zone - and the size was nowhere near large enough to cause any damage, but enough to shake the house a little and raise a few eyebrows. We have building work next door and had assumed it was connected to the builders digging out foundations creating some ground movement until we saw the news that confirmed it was a genuine seismic event. A big plume of smoke rising out of the Gavarres at about 2.30pm yesterday put our walking plans on hold as a huge forest fire had started in Vall.llobrega which is about 2-3km from us. 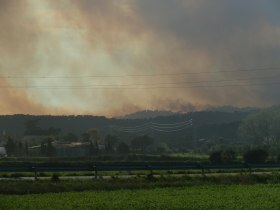 Forest fires are relatively common around the Emporda area but still quite devastating when they happen and one reason for being very careful not to start fires in the woods. For March to October, fires are banned from wooded areas or their vicinity because of the risk of a large scale incident and ironically yesterday was the second day of this year's no-fire season. 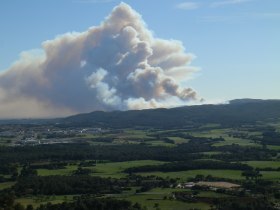 The second major factor in the bigger fires is the northerly Tramuntana. wind. This is usually a very strong and very dry wind that blows from the north and yesterday's coincided with a very dry hot day with temperatures reaching 27C in March. The wind whips across the woods and helps the flames to spread. Thankfully we were just to the north of the starting point for the fire, so the smoke and flames were heading away from us an area that we frequently use for walking and exploring. We did sneak a trip down towards Palamos and could see both the smoke and flames in the trees just above Vall.llobrega which, from where we were sitting, looked dramatically close. However, though around 400 people were evacuated, reports suggest the fire didn't reach houses. The fire though subsided in the evening, though there are still fire crews around and reports that it is not yet completely extinguished. 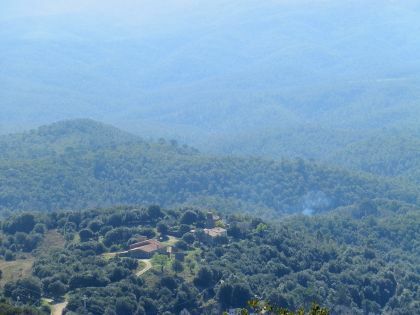 We postponed our planned walk and instead went to Quermany - the hill behind Regencos on what was a fabulously clear day (the views from Quermany across Pals and Peratallada to Canigou in the Pyrenees are spectacular) and watched the fire and helicopters and planes from the safe distance. 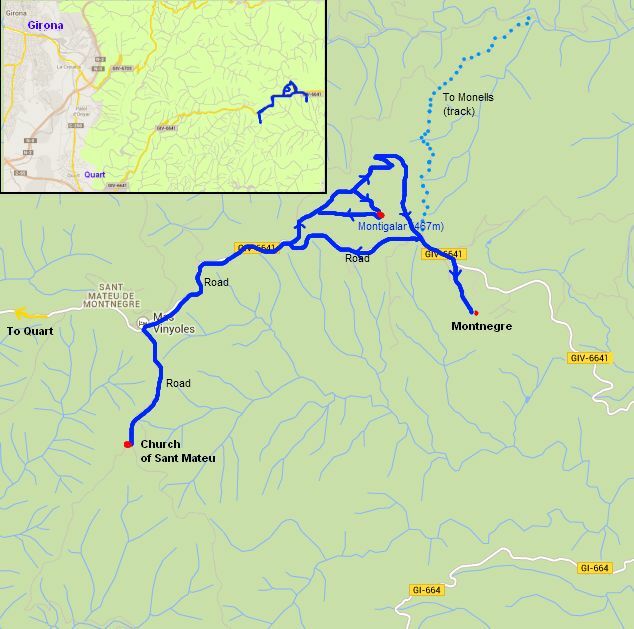 Montnegre (black mountain) is a name that is found several times in Catalonia but for today refers to an area in the heart of the Gavarres above the town of Quart and not too distant from Girona. 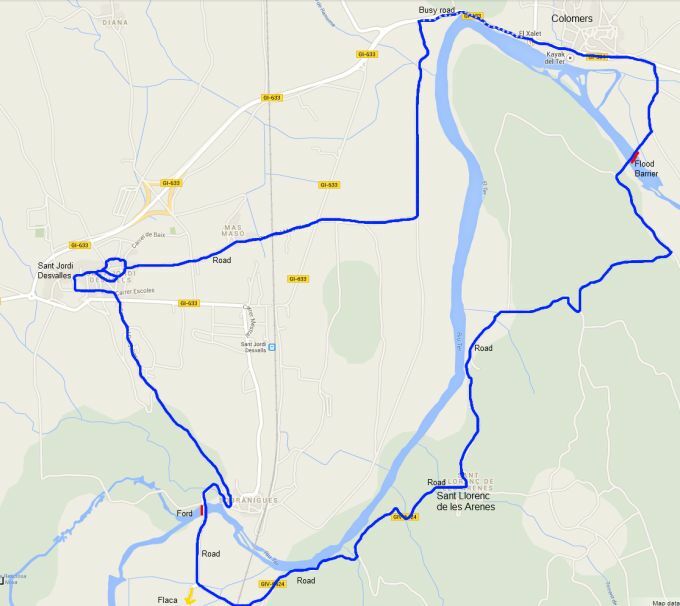 It's possible to cross the Gavarres north to south by one of four roads - over Els Angels from Girona to Madremanya, over the centre from Cassa de la Selva to La Bisbal, across from Calonge to La Bisbal, and the area we're exploring today which is the route from Quart to Monells - though this is only tarmac for the Quart side of the mountain. The central part of the Gavarres is quite large, mostly wooded, but with masias, churches, the occasional modern villas and surprising hidden fields from time to time. We're visiting an area we haven't really explored before so rather than start at the base, we decided to bring the car up as it would add about 16km up and down to the walk if we were to start from Quart. The roads up and across the Gavarres though are famed as cycling training routes for professional cyclists, and it is possible to cycle up - the gradients aren't too bad, it's just the 8-10km of climb that makes it a challenge. We decided to start at the church of Sant Matteu de Montnegre. 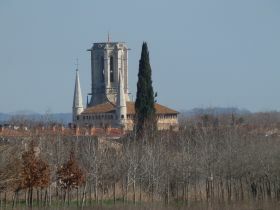 This is a small church perched on a promentary with huge views across the Gavarres to the Empordan plain to the north and the Girona plane to the south. There are routes down into the valley to the left and right and but our goal though is to find the hamlet of Montnegre on the neighbouring promentary, and unfortunately that means following the tarmac road that links the two. There should be crossings through the valley, but even with a map there are no clear paths for crossing the valley. From Sant Matteu we pass a number of houses - despite the relatively remoteness there are scattered modern houses in a sort of extended urbanisation with more infrequent older farmhouses around. The road is modern and done up and curls around the ridgeway that connects the two promentaries. It's March, but warm and there are lots of hunters out who have driven up with dogs. It's always slighly unnerving to see someone cradling a rifle as you walk past and as we're dressed in green jackets (the hunters wear orange) it's slightly worrying for when we come off the path into the woods just in case they don't see us. The object of the hunters quest are wild boar - senglars in Catalan. The Gavarres teem with them and anywhere you walk you'll see signs of disturbed earth where the boar root around for food. To hunt, dogs are used to locate the boar - dogs with bells or wireless transmitters are let loose in the undergrowth to sniff out the animals - the bells acting so the hunters and locate the dogs later. When the dogs find the boar, they start barking so the hunters know where to go. We leave the road and head for the viewpoint at the top of Montigalar. The path cuts into the woods and from the voices and ringing bells we can hear, but not see, the hunters in the woods to the left and right. We can also see the hunters cars some of which must have driven up the narrowest paths to find somewhere to park. Our route though takes us up the hill until we reach the top which is marked by a triangulation point and the Estrellada Catalan Flag. At the bottom of the flagpole is a small pessebre nativity scene to mark the spot. The views are glorious out across Monells and La Bisbal, or across the folds of the Gaverres in the other direction. We take a moment to wait until the encroaching hunting noises including the sounds of several shots echoing through the hills, start to recede and continue down around the bottom of the hill beneath the viewpoint. At the bottom it joins with the path that we had taken from Monells up and then links to the tarmac road. We could turn right strat back to Sant Matteu, but since our objective was Montnegre we go left for the few hundred metres it takes to reach the small hamlet of houses. There's a small church/chapel here and we walk down the lane to find it, but it's not clear if there is public access. Instead, we turn round and follow the road back, seeing a couple of road cyclists making their first ascent of the day. The sun is out. It's warm and we have the first butterflies in among the wild hyacinths so it's a shame we have to walk the same road back as we'd taken out. 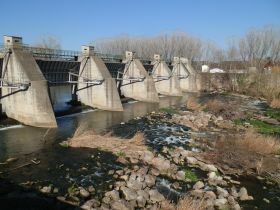 Bordils is one of the towns on the northern C66 route from Girona to the Costa Brava via La Bisbal that tracks the river Ter. From the main road the impression of Bordils is of a string of buildings along the main road, when in actual fact the town, like many of the towns on this route, sits a little way off. In Bordils case this is about 1km into the plain marked by a very large impressive church. We're actually back in Bordils to watch a handball match so this is a short exploration of the town and the area around, but because of the match we start at the sports stadium and then follow the road in towards the main church. Most of this area is an estate of large modern homes and it's not until we get closer to the centre that we get to see older buildings and a more classic nucleus. From the size of the church and the style of the buildings the town itself looks as if it was a wealthy farming community. 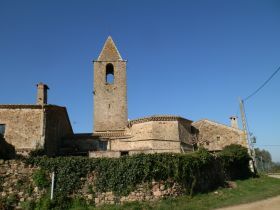 The church is tall with a apse flanked by two pointed towers, but the heart of the village is relatively small apart from a number of larger masias. After circumscribing the town centre we head out into the farm land and trees. Mostly the trees are fruit trees growing in the fertile soil and ample water from the river Ter, with large birch or beech plantations. 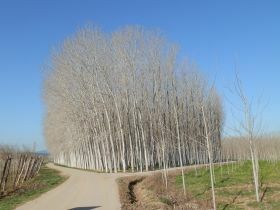 The morning is fresh but in bright sun so even though the trees are without leaves the light adds sharpness and depth. The road is empty apart from a cyclist and there is nothing around apart from the trees and two or three very large masias, and it's not just fruit trees - there are also specialist plantations of palms and decorative trees for garden centres. The road turns naturally to the left and we pass between two old masias and then start to approach the main road and industrial area. 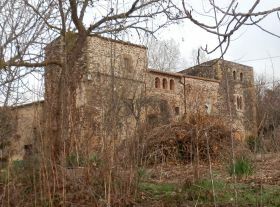 One of the masias was an old mill and still has water passing underneath, though it's now waiting for renovation. 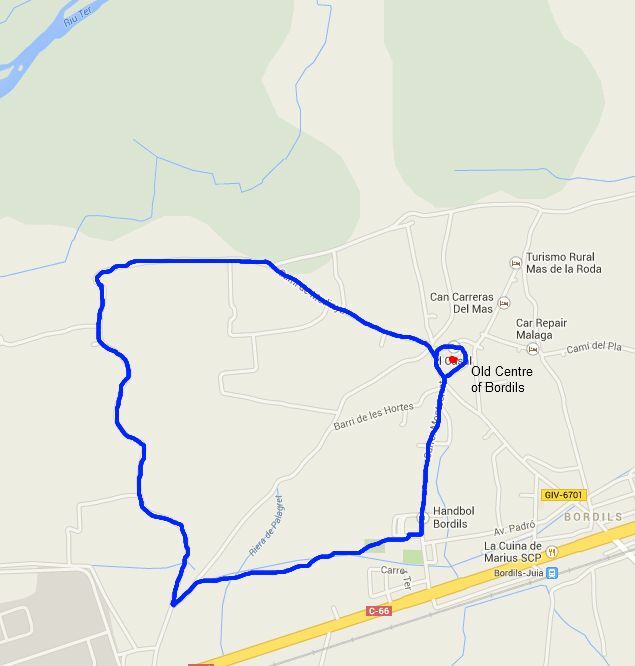 We follow the mill stream back through the large warehouses of Girona Fruit and back across the fields to the sport centre. 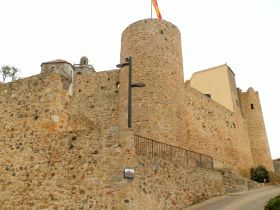 Castello d'Empuries was, until the middle of the 14th Century, the capital of the county of Empuries which encompassed almost the whole of the Emporda region and was a rival to the counts of Barcelona. 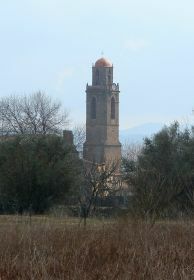 Castello d'Empuries itself sits slightly inland on the Muga river as, in the Middle Ages, this was an area of lakes and sea-marshes (aiguamolls) that were progressively drained or silted up. In recent times, these areas have been converted into the wetland bird sanctuaries of the Aiguamolls d'Emporda and d'Alt Emporda for the visiting flamingos, storks and other migrating and native birds. However, an area of the wetlands was drained in the 1960s and converted into one of Europe's largest residential marinas - Empuriabrava - a network of linked canals with houses, where each house has it's own mooring space. 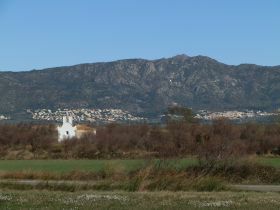 For tourists, it's easy to see the somewhat overblown Empuriabrava and miss the much more interesting and historic neighbouring town of Castello d'Empuries behind it. We want to visit for the history as much as anything. 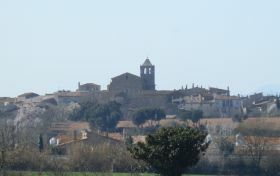 Castello d'Empuries is the only town in the Emporda region with a Cathedral (actually a Basilica) illustrating it's former importance. 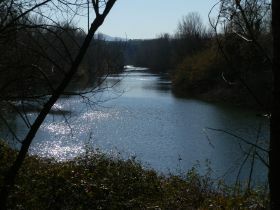 For walking, because of the previous lake, much of the surrounding area forms a flat plain crossed by ditches and drains that mean relatively few circular paths. As a result we're playing it by ear to see what we find, rather than having too strong a plan of places to go - we just know we're not heading for Empuriabrava today. We park at the sports centre. In Catalonia, practically every town with more than 2,000 inhabitants has some form of Poliesportiu Municipal mostly used by one or two particular sports clubs, like handball, basketball, football sala, but also more exotic sports like roller hockey or roller dance - so mostly organised sports and often much more a simple community facility than the professional 'leisure centre' in the UK. 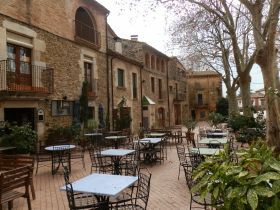 From the sports centre we walk into the centre of town in through older traditional stone terraced houses. Being a Sunday everything is closed, but walking through the streets, Castello d'Empuries shows it's medieval heritage with large buildings and ornate stone window dressings. In the early part of September each year, Castello has a Festival of Troubadors - medieval singers - with the whole town reliving it's past with events like jousting. 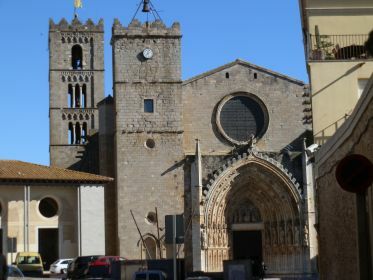 After zig-zagging through the streets we get to the Basilica de Sant Maria - known as the Cathedral of Empuries. When Catalunya first emerged as a buffer state between the Franks and the Moors in the 9th century, it consisted of a set of semi-independent counties - literally areas ruled by a count. As time passed and the counties became more established, rivalries grew up between the different counts resulting in a series of skirmishes/battles between the Counts of Empuries based in Castello and the Counts of Barcelona who were the dominate ruling family in Catalonia at the time. 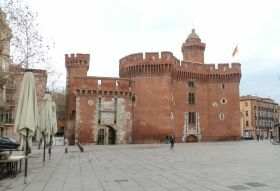 Eventually the rivalries were settled by intermarriage between the leading families (these unions by marriage eventually leading all the way to the unified Spanish monarchy of Ferdinard and Isabella) which then saw Castello diminished in influence as Barcelona became the pre-eminent centre of Catalonia. 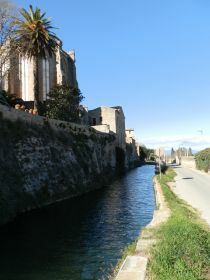 We take the road to the right of the Cathedral and emerge outside the old walls of the town by a river/moat. Historically, the area we can see from this point between Castello and Roses was a lake until about the 16th century providing both fishing and protection for the town. Gradually, as with many of the shallow lakes that were close to the sea, the area was drained and converted to fields, but with very low levels of habitation due to the risks of flooding, so the old town stops at it's old walls on this side. 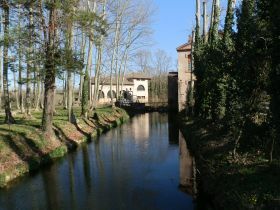 We walk along the river/moat and back into the city at the next gate. Though it's not marked as such this actually takes us up and through a restaurant garden. We continue back through the old part of the city past noted buildings with plaques and information on them, and past the Cathedral where a crowd has gathered. The bells sound and there is a flurry of rice thrown in the air as a newly married couple leave the church. We loop around back through the older section back to the river/moat and follow the water course as it narrows and then becomes a steady mill stream above the height of the farm land below. 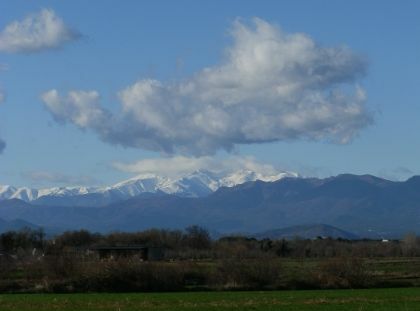 The area around is very flat with views out to Roses, the Albera Massif (which separates Spain and France between La Jonquera and the coast), and round to the snow on the Pyrenees to the west. Though the area nearby is flat with horses and stables directly below us, there are few marked footpaths, and little in the way of circular walks through the fields and Aiguamolls, so we stay close to the millstream and continue out into the countryside. It would be fair to say, that for me, walking on the flat lacks variety and that would be the case here. The scenery and views are great, but it doesn't change so much as we walk. 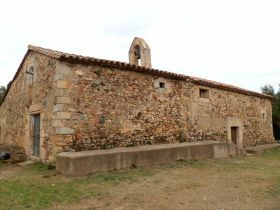 The flat area also has a sharp wind blowing across the plain, so we decide just to walk to the hermitage of Sant Joan de Setcloses marked on the map. It's just a small white fronted chapel next to a large old masia and a farmyard with what look like Aberdeen Angus cattle, but it acts as a focus point for the walk. 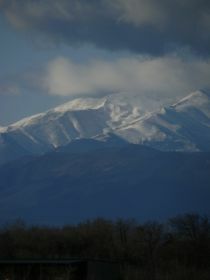 From the chapel we walk across the fields and over a small ridge which gives and magnificent view of the mountain of Canigo and the Pyrenees, covered in snow rising above the plain. 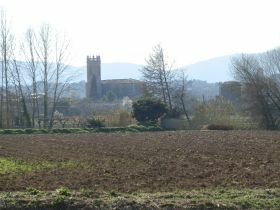 We turn back, through the fields and along the ridge to Castello d'Empuries. As we enter the town, we find some walking information for a path that follows the Muga river. We follow the path to the Muga as it wends it's way around the outskirts of Castello heading towards Empuriavbrava. The path is a broad passeo and passes an old bridge just behind the sports centre where we originally parked. 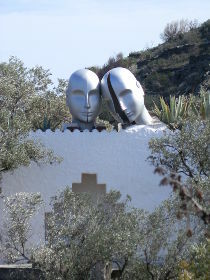 Begur is a popular area for people who come to the Costa Brava for walking. 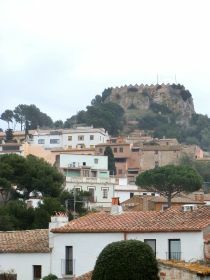 The town is on a hill which forms part of a headland that juts out into the Mediterranean leading down to a series of bays and beaches, such as Sa Tuna, Sa Riera or along to Fornells. It is possible to walk the entire headland in one go, but as we mentioned in the walk for Sa Tuna to Begur, our preference now is to make smaller loops, partly because the walks tend to be quite up and down. 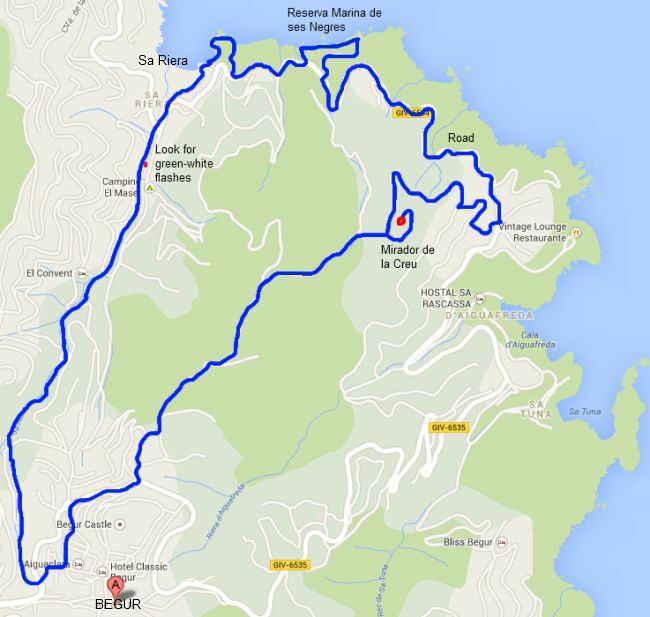 We've included Begur twice so far - the walk from Masos de Pals to Sa Riera via Begur, and the walk from Sa Tuna to Begur and back. This is effectively the missing bit of the triangle and takes us down to the coast along the Ses Negres Maritime Nature Reserve before returning via Sa Riera. 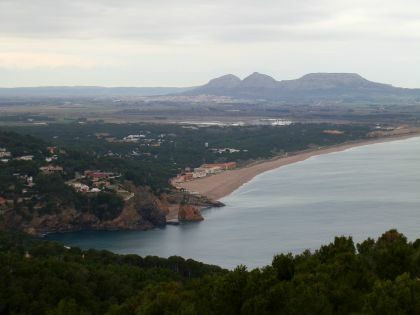 The first part of the walk to the Mirador de la Creu is largely a flatish walk from Begur centre into the woods and then gives fabulous views over the coast up towards L'Estartit and Roses, the Pyrenees and over the bay of Sa Tuna/Aiguafreda. We start in the municipal parking just by the Parc d'Arbreda below the main part of Begur town, then wind our way through the back streets part some of the old mansions built by returning Catalan tobacco and sugar barons who had made their fortunes in the Carribean, to the start proper at the second junction of the circumval.lacio road that runs around the bottom of Begur town, just below the castle. Being the start of February, the weather can get cloudy and we have an overcast day, but despite that the views from the top are spectacular and we can still see all the way along the bay of Pals and Pals beach, beyond Montgri and up the coast to Roses and to the left we can just see the snow on the Pyrenees peaking out from behind the clouds. The walk we're taking is marked with green-white flashes and is one of the routes that is included on walking maps of Begur from the tourist information centre (senderismes). Having said that, a signpost would still be useful at the start and return points as you do have to look out for the green-white flashes. Leaving the town and the first small urbanisation we are quickly into the woods on a broadish track with an easy relatively level walk. The woods have signs of quarrying and stone extraction, but just make for a pleasant wooded walk. The flashes take us along a smaller track and we emerge on a quiet road by the first signpost. 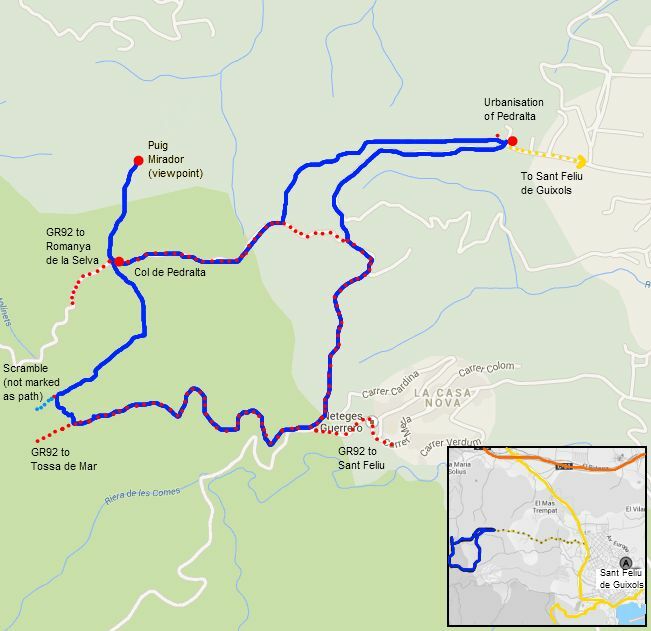 We have the option of going down towards Sa Riera, or a gentle upward slope to the Mirador de la Creu. We go up to the Mirador to start, knowing that we will have to double back down. The mirador itself has parking nearby for those who aren't walking, and consists of a rocky outcrop on top of the hill which requires a half-scramble to get up. 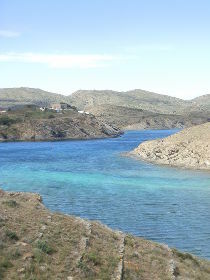 The views extend around almost 270 degrees, with Pals Beach and onwards to the North and the back of Aiguafreda/Sa Tuna beneath us to the south. Having taken our fill of the view, we return along the road we came up, but this time we continue down towards the coast past the scattered holiday villas that have been built along the road. Bizarrely though the road is practically empty, there are old broken and rusted street lights all the way down. At the bottom we run into more houses and have the option of either heading down to Aiguafreda and Cap Sa Sal, or continuing around the hill to Ses Negres and we opt for the second option. The road continues to curl downwards along the side of the hill and though we are walking on tarmacked road, it's quiet with no vehicles at this time of year. As we get lower, the green-white flashes indicate a side road to the left which at first glance looks like a dead-end. In fact there's a set of stairs that run past a house being built (technically the path was closed, but we ignored it - it'll be open again by the summer). At the bottom of the stairs, we are on a concrete path with a small wall that runs above dark red/black rocks that stretch down to the sea 10-20m below us. These are Ses Negres - the black rocks - an unusual colour and shade for this part of the Costa Brava and almost orange like the Algarve in places. The area is a maritim nature reserve and we can see cormorant fledglings sitting on the rocks with their parents. We can see the Isla Medes up the coast and right across the bay we can see the Isla Roja and Platja de Pals. The path curls around the coastline, then returns to the road just behind some large sea-side villas with infinity pools looking out to sea. 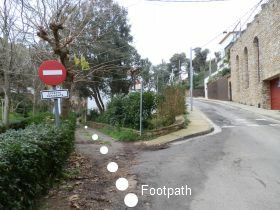 After a short bit of road-walking, the path returns to the rocks - you have to take care to look out for the green-white flashes as the signpost has been knocked down - and loops around to a small sandy bay by the side of the main Sa Riera beach. It's winter now and Sa Riera is largely closed up, but in summer the beach has dozens of small fishing boats lined up on the sand and holiday makers on the beach. We walk through the couple of streets of what was a small fishing village before heading up the road past the newer holiday homes that have been built. We're looking for the footpath by the stream back up to Begur, and it's not very well marked unless you know what you're looking for (it's the same path we came down for the Masos de Pals-Begur walk). We have to head out on the road as if we're going out and then the second track to the left has the green-flash on the stop sign. This takes us along a track to the back of some houses and we continue up the steps at the end and across what looks like someone's garden - don't worry this is the right way. After the garden we have the stream to our left and the path follows the stream all the way back up to Begur with a series of small cascades and rockpools as we go up. At various points there are steps and the occasional deep well shaft for when the river runs dry. The only complication is crossing the road a couple of times, where you have to look for the green-white flashes to know where to continue - basically still along the stream. The route is up all the way, but it's a steady climb so not too arduous and being by the stream there are trees and grass areas, though it is quite long, emerging at the top by Parc d'Arbreda again. 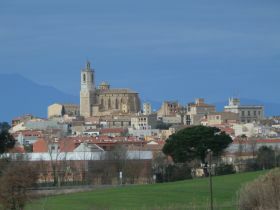 Perpignan is the closest French city to the Costa Brava and is reachable in about 80 minutes from where we live. In distance terms it's closer than Barcelona which means that when we want something special, travelling to France is another possibility. 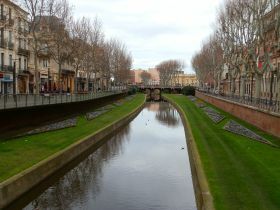 Perpignan itself was originally an important Catalan town, part of the old Catalan county of Roussillon and only became French in 1659. 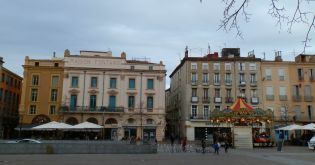 As a result modern Perpignan and the local area style themselves as being part of Catalunya Nord with signs in both French and Catalan (not Spanish) and there is a strong affinity for Catalonia. However, it also has a strong French feel and there is definite change when you cross the border. One of the visible changes is that you see rugby posts in the sports fields. Like many places in the south of France, people around Perpignan are fanatical about rugby and Perpignan itself has not one professional rugby team, but two. For rugby union there is the USAP (Union Sportive des Arlequins de Perpignan) who play in the French premier rugby league (Top 14), and for rugby league the Catalan Dragons who play as the only non-English club in the Super League for rugby league. Coming from the West Country, I was brought up on rugby rather than football and as it happens Gloucester, which used to be our local rugby club was playing Perpignan in the pan-European Heineken Cup competition so this was a chance to get to see my old home team once more. Unfortunately on the Spanish side of the border, rugby is still very much a minor sport in Catalonia. There is only one club for the Costa Brava - Senglars in Torroella de Montgri, and there is one in Girona. Barcelona has more across the city, and is trying to increase participation with help from USAP, and about four years ago, USAP came down to Barcelona to play Toulon in the Heineken cup at the Olimpic Stadium with 55,000 spectators, much to the city's surprse. Before we watched the rugby, we took a brief walk around the main town. It's actually a place we visit reasonably often. The shopping is different from the Spanish side of hte border - many French products don't make it across the frontier and there is generally a better selection of produce, and a different selection of goods and a different style and range and though prices tend to be a little higher in France, there are still some bargains for cross-border consumption. We parked near the rugby stadium (Aime Giral) which is to the south of the city and about a 7-8 minute stroll to the city centre. As we were walking up into town, lots of cherry-and-white Gloucester supporters were walking towards the stadium the other way. One tradition with many rugby teams, and USAP is no different, is that there is hospitality for visiting fans through the morning and the stadium itself has a number of bars and lounges for eating around the bottom for members and visitors. 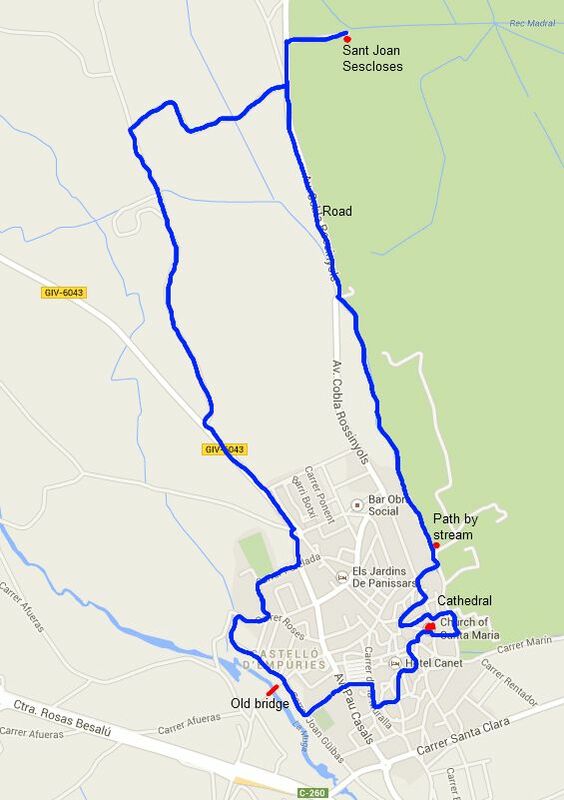 Our route took us over the river (the Tech) and then into town in front of the Castillet. This is a large red-brick castle/town gate that marks the entrance to the old city area. This is just across the canalised river Basse. From this point a network of old streets and buildings form the heart of the old town, most of which have been converted to plush shops or restaurants. There is plenty to explore, but we walk through the older section to emerge by the Place de la Republic, a large square with a merry-go-round in it and bars and restaurants all around. We then head upwards in terms of height in among the smaller streets of houses. Unfortunately the houses and area is a little run down and there is dog-mess all over the pavements (a problem we found all over Perpignan). Going up we reach the outer walls of the great Vauban fortification that surrounds the Palace of the Kings of Majorca - another ciutadella or fort construction built as a response to the annexation of this part of Catalonia in the 17th century. 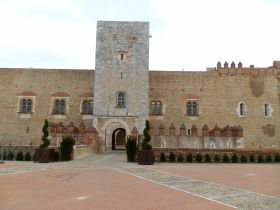 The walls, like the other forts in Catalona - Salses, Figueres, Roses, Girona, are massive and we skirt around the outside to find the entrance. 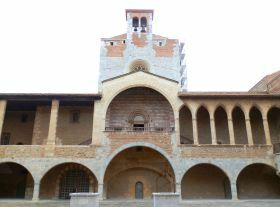 The scale of the building is surprising - particularly as it took us several visits to realise it was there. But it doesn't stop. A gate passes through the outer walls and a broad flight of shallow steps runs up inside the wall emerging at an open level giving great views over the city and out to the mountains of Corbiere towards Narbonne, and to Canigou and the Pyrenees. But we're not finished. Another shallow set of steps reaches the top and we reach the topmost building - the Palace of the Kings of Majorca - a much older Catalan castle/palace built when Jaume II King of Majorca (and son of the King of Aragon) made Perpignan the capital of the Kingdom of Majorca in 1276. We go inside just to take the picture, but we're on a schedule for the rugby so we don't have time to visit more thoroughly this time. We walk back down into the old city and out past the Palais de Justice and along the canalised river back towards the stadium. Being a Sunday a few food places are open but all the main shopping is closed. On a Saturday this is a thriving shopping area with all the standard French high-street stores like Fnac. And so to the rugby. What might be surprising is that USAP's club song is sung in Catalan, a Lluis Llach standard that our children learnt in school here. The game is good natured with calls of USAP matched by the sound of visiting supporters chanting Glo..st..er in the long west country accent. Gloucester won 18-36. 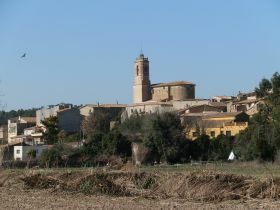 Corça is one of the Costa Brava villages from La Bisbal d'Emporda in the direction of Flaça (for the train station) and on to Girona. The old village is set back from the road and it would be easy to miss just our full of charm and character it has as you rush past in the car. We've walked from Corça on the northern side of the village (Corça, Casavells, Matajudaica). This was an opportunity to fill in a gap out towards Pubol and Flaça. 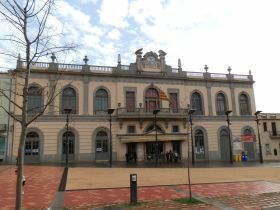 We start on the Sant Cristina side of the road and park by the Sala Municipal. 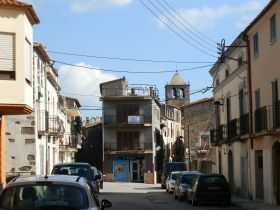 In contrast to the old village on the other side of hte main road, the Sant Cristina side of Corça is a residential area mainly made up of modern housing in a mix of terraces and detached houses on a small hill with views back to La Bisbal and up to the Gavarres above Monells so not too much to see. 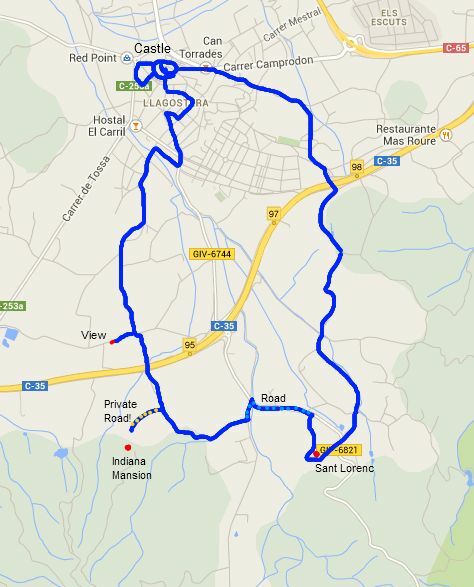 We head to the top of Sant Cristina and then onto a track that runs past a football field. At the far side of the football field we take a left following the diret track that is signed as the bike route for Pubol. (For most of this walk we found ourselves on bike routes, but mostly off road). We wander down the track with a field on one side and woods on the other before crossing a small stream on stepping stones. The path then emerges at a small tarmacked road by a farmhouse. The road is very very quiet so there is no problem following it along a small stream past fields and the occasional copice of birch trees. At one point we see a deep shaft just by the side of the road and looking on the map it seems this was once an area used for mining - though there is little other evidence. The road is rural and quiet and we reach a collection of three or four large masias that make up the hamlet of Planils, first two next to each other, then a third which looks older with towers like a castle a little further on. We're still on tarmac and just after the last masia a dirt track goes to the left and the map shows a more off road route. So we follow the track and then head into the woods a little further on. We continue through the woods for about a kilometre following sheep tracks in the soft soil, until the track reaches a tarmac road again where we turn right. We go down and then up the other side of a valley to the first of the masias of Cassa de Pelras. The masias here are large in a slighly darker stone with few windows to the road so they look quite intimidating. At the masia we turn left, then take the next right - again a track - which takes us to the cluster of buildings around the church. The church is small and there is a slightly odd bank of three stairs separate from the church (made in 1908 according to the plaque on it), that would have been used by musicians for village fesitvities in older times. 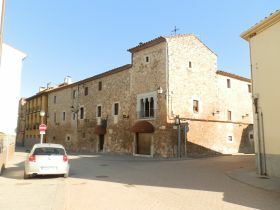 It's worth walking around the church as there are two small plaças in an area that only has about three buildings. 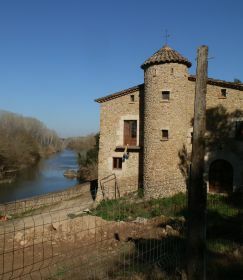 Cassa sits on top of a ridge which separates the valleys of the river Daro (La Bisbal's river), from the valley of the river Ter. From Cassa we head slightly north to meet the main C66 road - this is to reach another footpath and avoid walking along the busy road. We reach the bus stop and cross then take the path to the right of the house in front of us. We're in fields again and there are views now to the north across the Empordan Plain and across to Montgri. As we approach an old farmhouse we notice on the map that our next path is actually very close, so we try cutting through the farmyard to make the connection. Unfortunately we can't find a route through, but some neighbours walking dogs show us a route that involves jumping over two walls to reach the path and road on the other side. 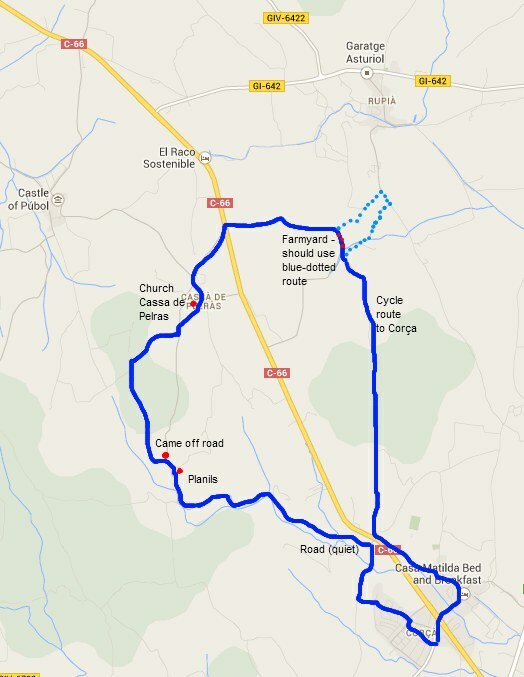 On our map, we'd recommend taking the genuine dotted line path. 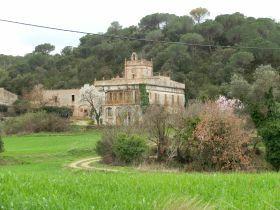 We are now back on a cycle path and a gentle down hill walk through a mix of fields and woods down to Corça, emerging at the main C66 a little ahead of the village just by the Mas Pastor restaurant. 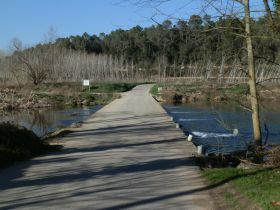 However, we don't have to walk along the road as there's a separate path back to the village that connects to a small road towards the older heart of Corça. We've described the older part of Corça before, but it remains an interesting and intriguing village of terraced houses and an inner walled centre. On the side of the village closest to the road is a delightful square with plane trees just by the river and restaurants and cafes (quiet when we went past). We cross the road via the underpass under the school and get back to the car.